(Saddle, Halter/Bridle, Halter lead, Reins, Stirrups, Chest part, 2 long side saddle tassels and girth). These Authentic Arabian saddle sets and halters were used many years ago and still are used by Bedouins and many Arabian horse owners to ride their horses. they are specially made in Arabian horse standard size to fit all Arabians and are made to guarantee durability, stability and reliability and are suitable for long distance rides. More tassels and custom made saddles can be made upon your request. The authentic Arabian saddle is totally100% hand made and braided. 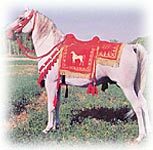 The saddle sets and halters are made of the best quality cotton, wool, textile and silk threads and beads in many colors. This beautiful hand craft is more than just a saddle to ride on, its an eye catching piece of Arabian art from the middle east giving you and your horse a touch of desert wonder, dignity and attraction. 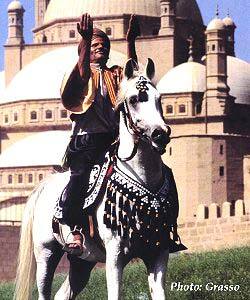 The Arabian saddle set comes with everything you see in the picture except the horse! The bottom surface of the saddles are made of 100% natural wool. The interior part of the saddle is made of cotton.